Assistant Chris Hutchings said Jewell had been watching a DVD of the game and expects him to be in charge against Sheffield Wednesday at the weekend. "I find it amazing Marcus Evans has taken a holiday. Everybody needs a holiday but Marcus's football club are in dire trouble. "His manager made a statement at the weekend that raised doubts over whether he wanted to carry on. For me, I would have cancelled the holiday and been at the game. "The situation needs to be dealt with. There needs to be much more clarity than this. The public want some information and it's not being given." Ipswich are bottom of the Championship and without a win in 11 games. "I expect him to be manager at the weekend," Hutchings told BBC Radio Suffolk. "He's just watching the DVD because we've got a big, big game on Saturday. "I'll be going straight into his office to try and analyse what we need to do, how we can improve it." Jewell suggested he was close to quitting the Portman Road club last Saturday after Saturday's 2-1 defeat by Hull. when speaking to the media on Monday, but his prospects look bleak following the defeat against the Rams. "Paul wears his heart on his sleeve," Hutchings said. "He was very disappointed on Saturday and to concede so late in the game makes it very hard to take. "I've been asked to come out and do some radio while Paul is watching the DVD and I'll be going back to help him out. "Paul has always been a fighter. In management you go through ups and downs and we're in a bit of a lull at the moment." 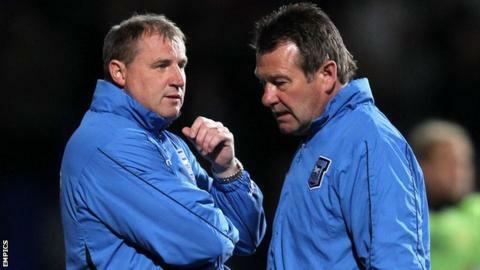 Should Jewell leave, he would be the third boss to do so since owner Marcus Evans took over the club five years ago. Jim Magilton and Roy Keane were both sacked by the elusive businessman, who was out of the country on Tuesday night, and Jewell could face a similar fate after 21 months in charge. "That's out of our control at the moment," Hutchings, who has assisted Jewell at Wigan, Bradford and Derby, said. "We're going to be preparing for Saturday. We have to work for a result on Saturday. "Paul always speaks to the chairman. I think he's on holiday, so I don't think Paul has spoken to him at this moment in time." Jewell did appear for an interview for the Ipswich official website.